MAY DAY – May 1st – has been celebrated as International Worker’s Day since 1890. The date was chosen by members of the Second International to commemorate the Haymarket Affair which occurred in Chicago, United States in 1886: On May 1st 1886 American unions held a nationwide general strike. An estimated 400,000 workers went on strike in Chicago. In the days following the strike, seven anarchists were framed and sentenced to death after a bomb was thrown at the police during a rally called on May 4th in response to an act of police violence following the strike outside the McCormick Harvesting Machine Company on May 3rd that left six workers dead. •May Day rallies also took place in various cities across Europe including: Paris, Marseille and Strasbourg, France; Sofia, Bulgaria; Seville, Andalusia; Barcelona, Catalonia; Bucharest, Romania; Zagreb, Croatia; Malmo, Sweden; Kiev, Ukraine; Turin, Italy; Lisbon, Portugal; Vienna, Austria and Vladivostok, Russia. •In Vancouver, Canada a black bloc with flaming torches led a March of well over 100 people through the centre. •Protests were also held across North America including: Los Angeles, San Fransico, Denver, Oakland and Portland in US and Ottawa, Canada. •Protestors burned effigies of President Enrique Pena Nieto at a May Day event in Mexico City and fought police in Oaxaca, Mexico. •Egyptian anarchists and other radicals held a demonstration in Tahrir Square, Cairo, Egypt. •Activists waved Lebanese and communist flags during a demonstration in Beirut, Lebanon to mark Labour Day. •Demonstrations were also held in Gaza, Occupied Palestine to demand better working conditions and access to work. •May Day demonstrations were held across India including rallies in: Tumkur, Ramagundam, Bangalore and throughout Nizamabad district, Karimnagar district, and Adilabad district. •Protesters in Manila, Philippines burned effigies of Barack Obama and Philippine President Benigno Aquino III outside the U.S. Embassy as 8,000 people rallied against contractual work, low wages and union busting. Anarchists took part in (and in some cases organised) demonstrations across the globe yesterday. 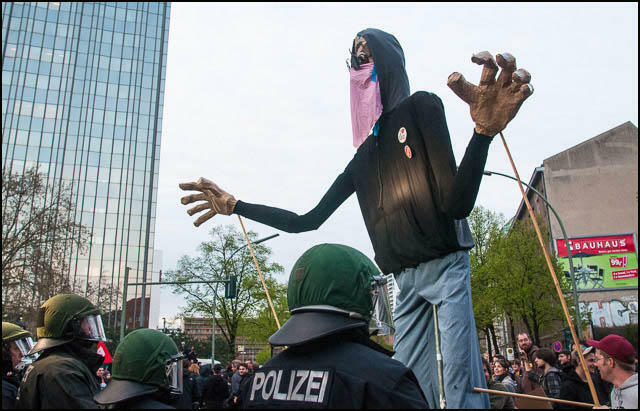 It is inspiring to see such a wide display of diversity from the international anarchist movement with comrades from every corner of the planet coming out onto the streets to celebrate May Day and fight for worker’s rights! The majority of demonstrations in the United Kingdom will be taking place this Saturday 4th May including a rally and march against austerity organised by Bristol Trades Council for 11AM at College Green. There has been a call-out by Bristol 1st of May Group for a Radical Block on the march. Come join Bristol Anarchist Federation and other anarchists/radicals under the red & black flags!